If you own and operate a restaurant, how do you quickly, easily, and inexpensively accept and handle online orders? It's a huge development task to develop your own mobile application, connect into Facebook, and create an online ordering system--unless you use the software from ChowNow (www.chownow.com), one of the newest startups to get funding here in Los Angeles. We spoke with Christopher Webb, the firm's CEO, to hear about how ChowNow's goal is to make mobile, social orders something any restaurant can afford and implement--and how a new $3M funding round from GRP Partners, Double M Capital, Daher Capital, Karlin Ventures, and Velos Partners is helping it to deliver on its mission. What is ChowNow all about? Christopher Webb: ChowNow is a startup here in LA, and it's a few years old. I started it with my cofounder Eric Jaffe about 2 years ago.We spent 2011 raising our seed round, which we used to build our team.and launched the product into beta about a year ago, at the end of 2011. We then spent the first half of 2012 beta testing the product, getting feedback and input to the point where we could start selling it. We launched it in March of 2012, at the National Restaurant Show in Chicago, took a booth, got lots of press, and we've been selling it every since. For folks who haven't used ChowNow, what does the software do? Christopher Webb: ChowNow is a platform for restaurants, focused on online ordering. The platform can be divided into three products. One is the mobile app. We've created a system where we can create a mobile app very quickly. So, every restaurants on ChowNow has their own, branded app. If you look up ChowNow on the app store, you won't find a ChowNow branded app, you'll find hundreds of individual restaurant apps using our platform. The second one is Facebook ordering. That's something we pioneered very early on, allowing restaurants to take orders through their Facebook fan page. So, if a restaurant is very active on Facebook and has a big fan base, we're a way to monetize that fan base directly. You'll see restaurants on our platform pushing out promotions, and without leaving Facebook their customers are placing orders and inviting friends. Our third product are menu widgets, which we've built for restaurants who have websites. It's a couple of lines of code which restaurants install on their existing websites, so that they have online ordering capabilities. It doesn't matter how old or young that website is, within minutes they have full online ordering. Those are the three products, mobile apps, Facebook ordering, and site widgets. There are two other parts of the system. One is a tablet we provide to restaurants. It's an iPad mini, locked down, which runs our POS system. It's designed just for our system. Every restaurant on ChowNow gets their own iPad, so no matter where the order comes from, whether that's mobile or Facebook, the order lands on that iPad and they respond off the iPad. The last component of the system is the dashboard. It's really the hub that drives everything. Anytime the restaurant needs to make a change, they do it from there, and it's really become a CRM system. Every order that comes through the system, all that customer information is tracked through that dashboard. They can see who those customers are, how often they order, what day of the week they order, everything based around the dashboard. How did you decide to tackle this market? Christopher Webb: My background is actually finance. I lived in New York for most of my life. Along the way I got involved with a couple of restaurants here in LA and in New York, as an investor. I started getting closer and closer to management, to see what was going on. At the same time, I was into trading tech stocks, for example Palm, and when they launched the Pre, watching Apple. I followed that very closely, and it was watching and looking at technology very closely, but at the same time being in the restaurant space. While I was in New York, I ran into other online ordering systems, which have been around for ten years. But, it didn't seem like that was being done very well. The idea really sprouted around what could we create for restaurants which was very turn-key, affordable, and easy to use. In the last few years, brands like Chipotle, Papa John's, Dominos those big chains who have the IT departments and million dollar budgets to throw at it have been able to create their own mobile ordering apps. A chain like Dominos, now does practically half of their business online or through their mobile app. However, if you're a small Mom-and-Pop, you can't compete. You just don't have the IT department, you don't have the budget to compete. We wanted to create a platform that allows restaurants of all sizes to compete and have the same tools. What we're looking to do is level the playing field. Are people using the product now? Christopher Webb: We launched about seven months ago, and now we have restaurants in 43 different states, with thousands of restaurants using it, and tens of thousands of customers using it daily. We're seeing more and more people using mobile apps, and everyday we're signing up new restaurants. We'll be in all fifty states in just a couple of months. 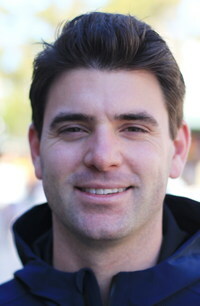 Christopher Webb: It's a SaaS model, and it's $89 a month per location. Unlimited orders, they can use the platform how they like. Some restaurants might not have Facebook pages today, and that's fine, they can just use the mobile app and widgets. On the flip side, we have some restaurants which have recently opened, and not even building websites, and using Facebook as their primary online presence. So, they don't use the website plugins, they just use the Facebook app. Some restaurants never log into the CRM and never care about it that much, and just want online orders and a mobile app. The platform is very flexible, and again it's very affordable, at $89 a month per location, and less for bigger chains. You were in LaunchpadLA, did that help with the funding? Christopher Webb: I actually met GRP prior to Launchpad, but going through Launchpad definitely helped strengthen that relationship. I don't know if they would or wouldn't have invested if we hadn't gone through LaunchpadLA, but I know it did strengthen our business going through LaunchpadLA. Being an accelerator, they really propelled us a little further along, and we're a little further along today. I do have to credit Launchpad for helping get the round done, and particularly for GRP's participation. What's the hardest thing you've had to deal with as a startup so far? Christopher Webb: Raising capital is never easy, and it took quite a while to get done. Thank god that's behind us for the time being. Here in LA, there are lots of great startups, and more and more launching every day. So you have lots of great startups, and lots of great founders raising capital. But, unfortunately, there's not a lot of VCs here in LA. You're just fighting for attention. There's Bay Area VCs as well, but to them, you're just another LA startup. You've got to fight for attention up there, as well. That's probably been the biggest challenge, which is fighting for attention with all of the other great startups here in LA. Now, our main focus is sales and marketing, and to sign up as many restaurants as possible. Luckily, we did a pretty good job with that earlier, and are just building off that. That's our primary focus now.